If you are a cards enthusiastic like me and can’t find bicycle playing cards near you for a cheap price (or not at all) then it would be wise choice to buy those from amazon in bulk. It is much cheaper than buying cards individually and you will definitely wear out your cards by using it regularly so it is best to have some spare cards near hand. This 12 decks of original bicycle playing cards are very affordable in price and will only cost you around $1.6 per deck (according to the price while I am writing this). The cards are originally made by USPCC so you can rest assured for the best quality bicycle cards from its creators. Personally I found those cards very long lasting and flexible. Most of us know the best feature of Bicycle playing cards, the feeling of those cards, long lasing and flexibility and all of those can be found here (Duh!). Bicycle cards are out there for a long time and earned its respect from all kinds of playing card lovers including magicians. And most of them prefer bicycle playing cards for various reasons. If you are new to this brand or this specific type (not very likely though because unlike my country, most country have those cards around for almost every cards game) then all I can say is trust me, you will not be disappointed. If you are still confused, see this honest pros and cons about this specific sets of cards from the dealer. Those are poker size standard index playing cards and each packs of cards comes with 52 cards plus 2 jokers and 1 guarantee card so if you find any problems on those cards you can replace those easily with the guarantee card. The Annoying “Free App” ad on the pack of the cards. The cards are made of paper so rigorous use or water will cause damage to those cards. Q: Are all of those cards the same color? A: No, 6 of them is Red and other 6 are Blue. Q: How are those different from the cards I found on the store. A: If the cards on the store are original bicycle playing cards then basically there is no difference at all! Q: Does the pack contains any gaff cards (for various magic tricks)? A: No, only regular cards. 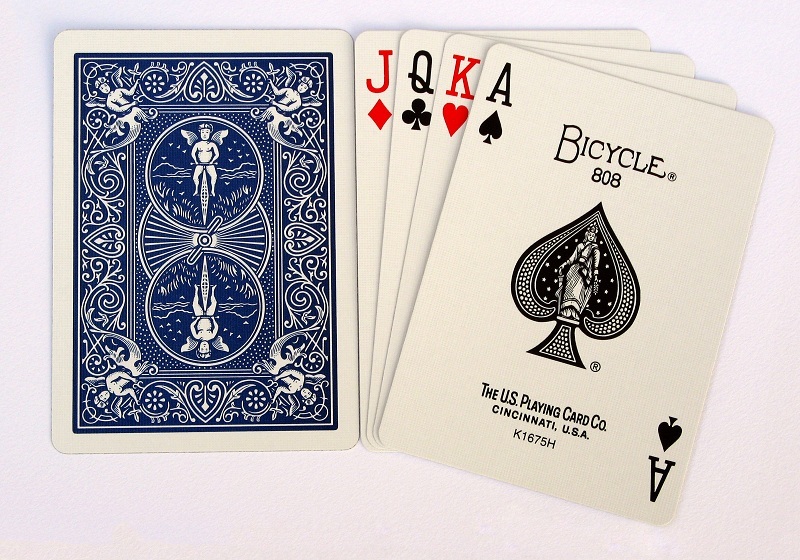 What other customers are saying about these 12 decks of bicycle playing cards? You can view more of those reviews from all the customers on amazon. Even in conclusion, I cannot stress the quality of those cards enough. Compared to the other bards this cards are leading the industry from the start and rightfully continues to hold its place. So for whatever reason if you are thinking of buying any playing cards and you know that you are going to need some more cards in the future, just buy these and get most out of your money at hand (or in bank ;)). Here is a great watch for you to look into, Luminox 3001 Navy Seal Dive watch is originally made in Switzerland and you know the great quality of a quality Swiss watch. The watch is specifically made for the Navy to use underwater and in extreme situations. It has great design and durable materials so it is long lasting and comfortable. It can also be used in dark environments because it glows on dark and very easy to watch the time without any other light source or any effort. This watch is also great for scuba diving. From 1994, when the watch was first introduced, it has been so popular among the armed forces and civilians that Luminox is forced to produce the watch even after 20 years to meet the demand. The watch is made to withstand combat situations and other difficult scenarios. Luminox 3001 Navy seal dive watch is made to last longer than most other Luminox watches. 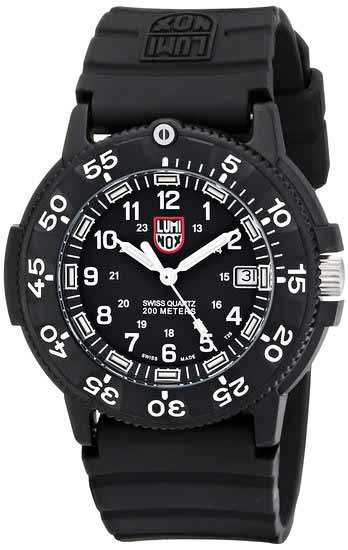 Many reviewers are saying that they are using their Luminox 3001 for over 10 years with minor problems. It’s stainless steel watch case and mineral crystal glass ensures more lifetime and the dial marks are made to glow for over 25 years without any recharge. It has a self-powered Illumination system so you do not have to worry about the lights to wear out. Luminox Navy SEAL Dive watch is specially made for diving in the water for the Navy. So it will resist the water to 200 meters. It is great for scuba diving. The watch case perfectly designed to prevent water from going in, so you do not have to worry about your watch while having fun or on the mission. As this watch is made for the Navy and other Law enforcement people, it is designed to tackle heavy and rough combat situations. If you are on a mission underwater, in the storm or any extreme place, you can easily rely on your watch. The watch is made of durable materials to give you the best use of it. Luminox 3001 Navy SEAL Dive watch will work under any situations and it is extremely easy to see the time because of the Illumination System on the watch. The dial marks glow in dark environment to make it extremely easy to read the time without external light source. You do not have to press any button to see the time, it is glowing all the time. The Illumination system is self-powered, that means, you do not need to worry about to charge it for about 25 years. It also does not require any battery or light source to charge. Black and military-style design look great while using it for general everyday use. It is very lightweight and the materials are very durable. Even if you are not in the Navy or any other law enforcement, don’t be discouraged to use the watch. The watch is great for use in the water or on the sand. So whatever environment you are in, the watch is suitable for you. It is very comfortable to wear and you will show more confidence wearing this good looking and heavy duty watch. You have to cover the watch in Stealth operations because of the glow, that’s the price you have to pay for this cool watch because you can see the time in any dark environment without an external light source! Might have to change the battery after 2-4 years, don’t expect to last batteries for thousands of years. Sometime some water might get into the watch, but it won’t affect anything according to some reviews on Amazon. Q: Is there any warranty on this product? Q: Can I buy it from any country? A: Yes, the seller of the product on Amazon supports international shipping. He also states that he recently lost this watch and he loved it so much that he is definitely looking forward to buying another same model watch! So, at the end, you will get those amazing features and experience with this not-so-expensive watch. This feature-rich high-quality watch can easily beat any other more expensive watches. If you are looking for a tough, long-lasting and waterproof watch that is accurate and usable in any condition then this watch is a perfect match for you. This is one of the top dive watches available on the market. Solid design and water resistant feature made it popular dive watch for men. So why are you waiting for? Do yourself a favor and get this watch. I am sure you will love it! 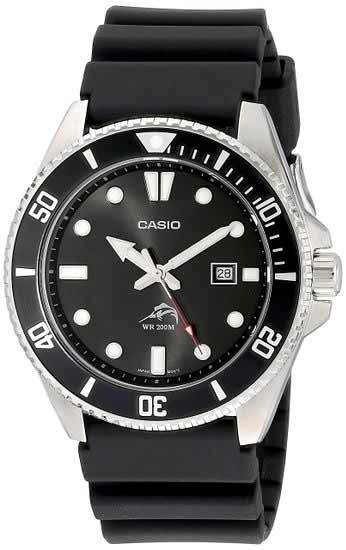 Casio has made hundreds and thousands of watches and has some amazing watch with unique features. Casio Men’s MRW200H-1BCT Black Resin Watch is one of them. What’s unique about this watch is that the watch has some of the attractive features of an expensive high-quality watch but in a very low price. That is what made the watch much more popular for an everyday watch. This watch is very stylish comfortable and has the waterproof function for light use in the water. It also has luminous dials so it is easy to see the time in the night without external light source. The resin case made it very lightweight so it is very comfortable to wear all day long. Water Resistant up to 330 feet, suitable for swimming and snorkeling. The watch can be used for swimming and snorkeling. It supports water resistance for up to 100 meters or 330 feet which is very rare on the watches with similar price. You can use this watch all the day and don’t have to remove it for the shower or fun time on the water. It can also tolerate salt water. This watch has both normal 12-hour time along with 24-hour military time for those who are not comfortable to convert the time. It also has day and date feature at 3 o’clock position which easily helps you to know the current date or day of the week. A very handy feature for many people. The heavy design of this watch makes it very same look to G-shock or other expensive watches. It is very hard to tell the difference. Also, the lightweight body makes it very comfortable to wear and the strap also looks great. Overall great design. Some customers are having a problem to set the day and date. You have to know that you can only set date/day 3-4 hours before midnight. Q: Is this watch suitable for salt water? A: Yes, this watch can be used in salt water like in the sea. Q: How do I set the date? A: Pull out the crown one click then rotate it. The time has to be 3-4 hours before midnight or you may face difficulty setting the date/day. Q: Does it have a backlight? A: No, but the hour and minute hands are luminous and it is easy to see the time without backlight. To sum up my words or the words by the customers of this watch on Amazon, this is a great watch for the price. 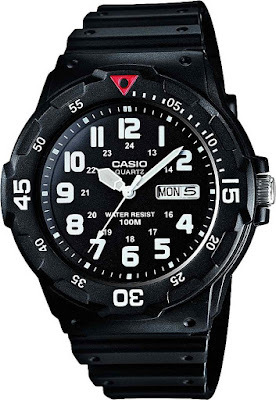 A cheap watch does not always mean cheap quality and that is proved again by Casio with this watch. The watch can easily compete with some of the more expensive watches by the features such as water resistance, luminous dials etc. It is also very lightweight and has very attractive design. So if you are looking for a great watch in the budget then I think this will be your best buy. You will not regret it. Download and install iDisplay on your Android device and on PC. iDisplay is a paid android app that costs $4.28 and you can easily find it on Google Play. Download iDisplay for your Windows XP/Vista/7/8 directly from http://getidisplay.com/. They currently do not have any version for Windows 10. You might need to restart your PC and give permission to the software when it asks. Connect your Computer and Android to your home WIFI. Example: Connect to a router (Internet connection not required at all). 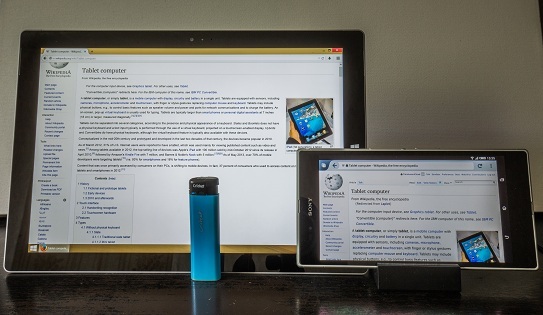 If you do not have a router, just connect your android to your PC via USB (I will write details about how to connect iDisplay to PC with just USB cable in my next article). Launch the iDisplay program on your PC. Move you cursor to iDisplay icon on the taskbar. You will see an IP address and port number. You will need this in a second. Run the iDisplay app on your Android phone or tablet. Most of the time, if you are connected to the PC with a router then your Android device should automatically be connected. If not then tap on the plus (+) sign on the app and write the IP and Port you just got from step 3. Give any name to the connection then tap on “Add and connect” button. On your computer screen iDisplay will ask you if you want to accept this incoming connection. Hit “yes” or whatever button it takes to accept the connection (I clicked do not prompt me again and installed it a while ago, so I can’t remember what exactly it says). That’s it! You have successfully made your Android device a secondary screen for your Windows Computer (of course you can use your android as a regular phone! Just hit back button or click on disconnect for the options). You can also use the touch feature too! I think that’s a really useful thing for some cases. I actually used a cheap Symphony Android phone that was made in China and available only in Bangladesh. So I think it will work with any other branded Android phone in the word! If you have any more question or of you have any problem using the software just let me know. I will be happy to help you.